All of our body treatments are done by professionals and will make you feel like a brand new person. Our state of the art equipments ensures everything is done to the best it possibly could be. These treatments make you slimmer and detox your body. Le Reve Rittenhouse Day Spa in Philadelphia presents body treatments that will wow you; all of these treatments are designed to make you slimmer, provide restoration, and detox your body. They are, in every way, helpful and perfect for the everyday stressed person. These detoxing and purifying wraps, scrubs, and treatments all extinguish the things that your body doesn’t need and doesn’t want while providing restoration for your body and mind. As it is doing the detoxing, it is also slimming you. The heat and the specific scrubs, oils, and creams are all designed to help you lose weight and make your figure look more defined. As well as the physical benefits, it also makes your skin look, feel, and actually be healthier. All of our body treatments are done by professionals and use restoration to make you feel like a brand new person. Our state-of-the-art equipment ensures everything is done in the best way possible. These detoxifying, slimming, and healing body treatments are all performed by skilled therapists. As one of the best spas in Philadelphia, Le Reve offers different packages with our body treatments as well as single services with these treatments. We pride ourselves on our treatments and how well they are performed. The way a customer feels and looks after having one of our many treatments done is what we pride ourselves on. The skin is the first thing people see and notice since it covers all of you, so why wouldn’t you want it to look the best it can? The body treatments we offer such as the salt/sugar scrub, Detox Body Wrap in Sybaritic Blanket, Herbal Body Wrap, and the Himalayan Salt Therapy. Each treatment is designed to provide restoration for your body and mind, and also make you look and feel the best you can. 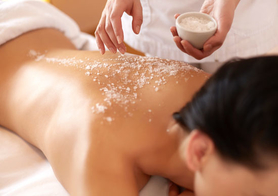 Every body treatment works a different part of the skin and body, so for instance, the scrubs will clean out the skin and leave it looking like new, while the Himalayan salt therapy will make sure the salt is heated to a perfect temperature and seeps into the open pores and cleans the skin. Le Reve Rittenhouse Day Spa offers an extraordinary Slimming and Detoxifying Body Wrap. This one of a kind heated body wrap helps the body draw out heavy metals, chemical toxins, microbial compounds, and byproducts from protein metabolism by the most natural process of shedding excess body fluids. It is beneficial for all guests who to wish to improve the texture of their skin, enhance the senses, encourage weight loss, increase vitamin and mineral absorption, purify and reduce blood fat levels. Le Reve Rittenhouse Day Spa presents a natural Herbal Body Wrap treatment for ultimate refreshing body feeling. Our massage therapists use all natural extracts of seaweed, with combination of collagen and elastin; and wrap it around the body. This treatment encourages reshaping and contouring the body, as well as reducing the appearance of cellulite and stretch marks while the herbs penetrate deep through the skin pores and cleanse underlying tissues. Le Reve Rittenhouse Day Spa gladly invites our clients to explore our revitalizing and energizing scrub that will essentially exfoliate and dehydrate your next layer of skin, leaving it smooth, velvety soft and providing you with radiant glow. Mineral-rich salt from the sea will not only nourish and promote healing on the skin but reduce rough, dry skin, uncovering a baby soft texture unlike you’ve ever felt. Salt has anti-bacterial qualities, so it’s helpful for maintaining bacteria-free skin and preventing itchiness. Le Reve Rittenhouse Day Spa invites our guests to experience our signature hydrating sugar scrub that is formulated with a combination of sugar, oils, and aromatic scents, and are designed to exfoliate, cleanse, and smooth skin in similar fashion to the salt scrub. Besides general cleansing and exfoliating purposes this treatment is also often used to prepare the skin for other services such as massage. Discover the nourishing power of pure herbal infusions leaving the entire body feeling silky and soft.